Na-na-na-na-na-na-na-na-na-na-na-na-na-na! A brand new Katamari Damacy game is set for release on iOS gadgets on September 29. The game totals 24 missions including six completely new stages and four Mission Modes: Story, Time Attack, Exact Size Challenge and Eternal Mode. Additionally, one Extra Stage is included with PAC-MAN making a special appearance. Similar to the original, various control methods are supported: Accelerometer or Virtual Pad controls, the latter including single or double virtual pad options. Additional content packs with past and future stages are in development, set to release at a later date. According to the press release, the game will appear in two flavors. The "lite" iteration will be free and include a single time attack level, while the full version will set you back $4 and include all of that stuff the company mentioned above. As usual, both versions can be found on Apple's App Store. Before I say what I'm about say, I want to point out that I adore the Katamari Damacy series. It's everything quirky and experimental about Japanese game design in one simple, fun package. That said, the series has been on a decline since the original. 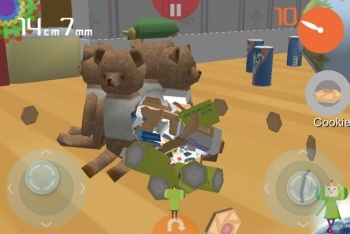 The previous iOS game (2008's I Love Katamari) ran like a leprous dog on the hardware of the time, and all the gameplay seemed recycled from earlier, better Katamari titles. I hope that Katamari Amore is a return to form. I'm going to buy it regardless because I have no impulse control, but I will glower sternly at Namco Bandai if slowdown or incomplete level design hinders my ball-rolling adventures.